Scrapbook "Wings" 72 page 335mm x 240mm - Very good quality scrapbook at a value price. Scrapbook "Megasaurus" Bond 64 page - 335mm x 240mm - Premium quality bond paper (approx 100gsm) sets this scrapbook apart from the others. A2 Sketch Pad Gummed 50 Sheet- 110gsm Cartridge paper with an even surface- 100% Acid free- Suitable for pen and ink/calligraphy, technical pencil and coloured pencil. 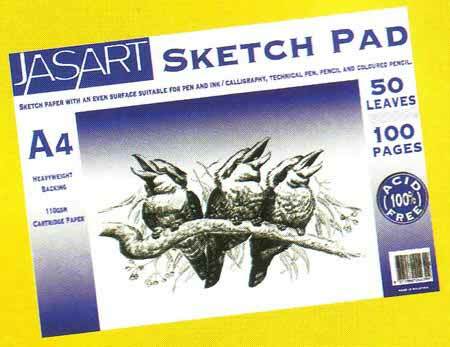 A4 Sketch Pad Gummed 50 Sheet 110gsm Cartridge paper with an even surface- 100% Acid free- Suitable for pen and ink/calligraphy- Technical pen, pencil,coloured pencil.